Phew. American businesses are hiring again. The U.S. added 287,000 new jobs in June, according to the Labor Department report released Friday. It's a massive rebound from May when the U.S. added a mere 11,000 jobs. Unemployment rose slightly in June to 4.9% (up from 4.7% in May). That's actually a good sign because it means more Americans are looking for work again. 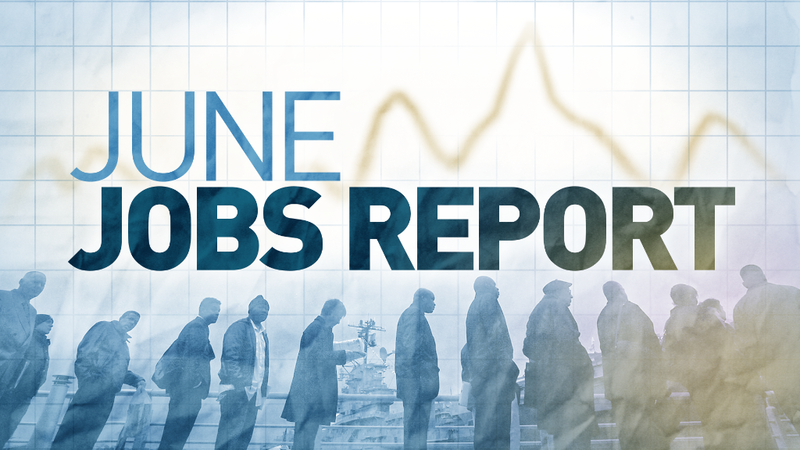 The big boost in hiring in June alleviates fears that the U.S. economy is sputtering. It's especially welcome news after the Brexit shock that rattled markets. Stocks rallied Friday morning. "The economy continues on a solid, but not spectacular path," says John Ryding of RDQ Economics. Perhaps the best news from the jobs report is that wages are finally showing signs of life. Wage growth picked up to 2.6%. That's still below the 3.5% or so the Fed would like to see, but it's a healthy bump from earlier in the year when wage growth was barely above 2%. Finding "good paying jobs" has become a key issue on the 2016 campaign trail. While the June jobs figure is eyebrow raising in a good way, it's unlikely to be enough to sway the Federal Reserve to raise interest rates at its July meeting. "Nothing in this report that signals the Fed needs to hurry to raise rates," says Kate Warne, chief investment strategist at Edward Jones. "It's a first step, but we'll need to see many other positive signs before the Fed is likely to move." Economists surveyed by CNNMoney predict one rate hike in 2016. It's possible that could come in September, but more likely in December. Many believe America is at -- or near -- full employment, although U.S. Labor Secretary Tom Perez is quick to say, "We're not there yet. We've got more work to do." The overall share of Americans working is at its lowest point since the 1970s. The decline in the labor force is partly explain by Baby Boomers retiring, but there's also concern that some people just gave up looking for jobs after the Great Recession. Labor force participation did increase slightly in June. America added millions of jobs in 2014 and 2015 in the biggest hiring spree since 1999. The U.S. was routinely adding well over 200,000 jobs a month. That rapid pace of job gains has slowed this year. While the June figure was big, the three-month average for job gains is only 147,000. "There's been a significant loss of momentum from the end of last year," says Lindsey Piegza, chief economist at Stifel Nicolaus. "The slower pace of the job creation matches the reduced pace of the economy." The U.S. economy is only expected to grow about 2% this year, which is below the historical average and a slowdown from the 2.4% growth last year.